The Tri-State is seeing some severe weather that has been taking its toll on roofs, trees, and power lines. Officials are reporting multiple downed trees in Gibson County near various streets, including Division and Main, Morton and Clay Street. 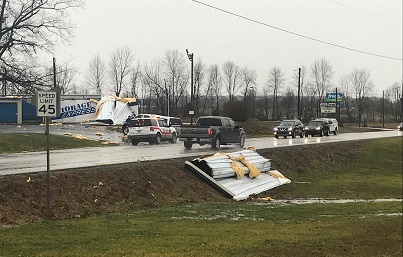 Other reports are saying roofs have been blown off of some of the buildings near a golf course in Oakland City. Telephone lines are reported to have snapped near the city with the damage being along State Road 64 going through Oakland City. For drivers in Vincennes, flooding has been reported at U.S. 41 and 6th Street. In addition to wind damage and flooding, hundreds of customers are without power across the Tri-State. According to Vectren, 43 customers in Pike County and 39 customers and Newburgh are without power. Duke energy is reporting 334 customers in Gibson County that are without power. The big numbers are coming out of Kentucky, where officials are saying 1,123 customers are without power in Webster County. 442 customers in Henderson and 172 customers in Hopkins County are reportedly without power as well. Stay with 44News on-air and online for updates.